Rob Jones had a meteoric rise to the top, and an equally quick fall from grace. From being an unknown right back at Crewe Alexandra, to arriving at Liverpool and making his debut against Manchester United at Old Trafford, at a time when they were head and shoulders above the rest, only to completely mark Ryan Giggs out of the game, Jones seemed to take it all in his stride. Born in Wrexham, North Wales in 1971, but grew up in Ellesmere Port, Cheshire, he is the grandson of a former Liverpool player Bill Jones. 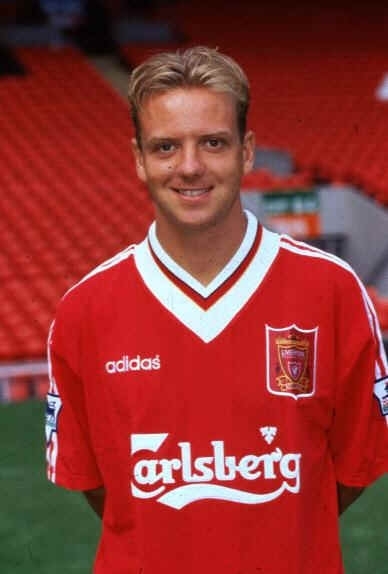 After impressing at Crewe, Liverpool swooped to get the youngster for £300k on 1st October 1991, in the days when transfer windows were not in place. Without a doubt, Jones was the best signing made during the Graeme Souness era, and one of the best right backs in English history. He made the right back slot his own before the arrival of Roy Evans and his, for the time, new system of a back three with wing backs. Slotting in at right wing back, he never looked entirely comfortable going forward as much as the system required, Jones still provided the width that made the formation work, until an injury ruled him out. While Jones was out, McAteer had made the new position his own, with his industry and crossing he was almost perfect for the wingback role that never quite suited Jones completely and that left a quandary for Evans to sort out. Jones was clearly too good to leave out, but McAteer was doing too well to drop. In the end, Jones was brought back in as a left wing back, which just highlighted even more his unsuitability for the wing back role. Though he had pace, he was a willing runner, Jones could cross a good ball in, in fact he had everything in terms of ability required to be a world class wing back, he just never looked comfortable. Jones was always best in the defensive sense, it didn't matter who the winger was that he was facing, he would shut them out of the game. Ryan Giggs said he was the most difficult opponent he ever faced and admitted to never having been able to get the better of Jones. Rob Jones was the epitome of the old fashioned fullback, the defender who could be relied upon first and foremost to defend, but also to get forward and support attacks when the opportunity presented itself. Being unable to score a goal in his 243 appearances in a Liverpool shirt suggests he would have struggled in the modern era, but personally I think he would have just become the example others followed. He really was that good. Jones's tackling was exemplary, his positioning excellent, he was decent in the air, strong, quick, had a great first touch, good range of passing, decent vision. Trying to pick faults with his game is where I am struggling, other than his shooting. That inability to score was probably the worst part of his game, as it just seemed like he was cursed at times. If Jones had not suffered injury problems with shin splints and back problems that brought a premature end to his career, then he would have been England's first choice right back, ahead of Gary Neville. That is not a slight on Neville, or any other right back of the era, that is just because Jones was so good. In my opinion, Jones is the best right full back I have seen play the game. It is just a shame that injury robbed the game of a truly world class talent. It is no wonder that his biography was entitled "Robbed", as the injuries that saw him retire at just 27 did rob the game of his talents.